There is a useful utility called TaskLayout which allow user to preserve desktop layout which includes shell folders, web browsers and any other apps with their specific positions on screen. 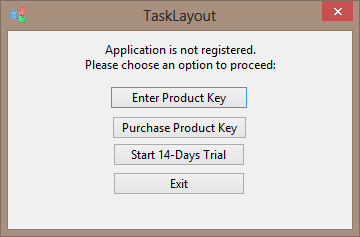 TaskLayout will start (if it is required) and arrange these windows/applications to restore the state in which you saved them. Thus, for instance, you can instantly open folders with long paths or find items with complicated locations that you cannot remember. The software can save Windows Explorer, text files, images, Control Panel and a series of other dialogues to the layout file. Freeware, portable, installer is a self-extracted 7zip. License type: free for personal non-commercial use. From the maker of TaskSpace, which is here on the site. Do you happen to know where it writes settings? webfork wrote: Do you happen to know where it writes settings? There is a local file SETTINGS.XML beside TaskLayout binary which stores all the settings. Last edited by grayn on Tue Sep 19, 2017 1:10 am, edited 1 time in total. Just FYI you'll need to go into the tray settings after launching the program and enable 'Portable Mode'. Which will then save to a new file named SETTINGS.XML (either at that moment or after closing, can't recall). May have been because I unzipped the self-extracting archive myself that it needed this, not sure, but thought I'd mention it. I found no other files created or registry entries created so appears fully stealth. This is a great program, but I can’t get around one problem. If I’m using Chrome and open multiple tabs, I can’t get it to simply make Chrome an active window and resize. It opens a new instance because the window title doesn’t match if you are on a different tab than when you saved it. Any ideas? Please remove version number from thread title. Thank you. I wonder wouldn't it be appropriate this thread to be moved to Portable Payware Discussion sub-forum since the program is no longer free. Thought about that too, but didn't want to get carried away. Let's see what webfork has to say, OK? Seems a few programs have changed their license of late. Do we just link to the last free version (where available) as with other programs that have changed with updates? The version I have is 0.6.0.2. I have TaskLayout versions 0.6.1.0 & 0.6.1.1, I can upload them both if needed. My suggestion here is, if we can find an earlier version / mirror that's freeware, we can keep this in the Submissions thread. If we can't or there's something in the license around redistribution, then I'd agree with smaragdus about moving to payware. I found a mirror (probably going to get removed anytime) and I'm checking now. Yeah unfortunately there's a redistribution clause in the license that makes this payware in my opinion. EULA wrote: You may not distribute, rent, sub-license or otherwise make available to others the Software or documentation or copies thereof, except as expressly permitted in this License without prior written consent from SystemGoods (Nikita Pokrovsky). In the case of an authorized transfer, the transferee must agree to be bound by the terms and conditions of this License Agreement.